Filed under Star Trek; 3 comments. In 2010, I bought the complete box set of Star Trek: The Next Generation on DVD. It was an indulgence I'd long lusted after, and once I finally had it… it sat in its box, unopened and unwatched. A year later, I bought my first Blu-Ray player and began lusting after a new prize: The Next Generation in high definition. I blogged at that time about the significant work the studio had done to remaster this classic television series, and theatrical screenings of highlights of each updated season were proof that my dusty old DVDs fell short. I sold the old box set to a friend last fall but left its space open on my shelf for a high-def replacement. The only thing keeping me from buying the complete series (again) was that each of the seven seasons was available individually only; there was no box set collecting the entire run at a more affordable price. Such a set was announced just yesterday: Star Trek: The Next Generation — The Complete Series: Epik Pack launches on June 7 for $208.99. But I didn't know that a month ago, which is when I felt the itch to splurge. Some online searches unearthed an alternative to waiting for a domestic release: Amazon.co.uk sells a complete box set of region-free Blu-Ray discs for only £66, or roughly $100 USD including shipping. Such a deal! I was sold. This box set was a perfect purchase at a time it was most needed. I look forward to boldly going through my first Star Trek, seeing it as never before, sharing it for the first time with my mom. 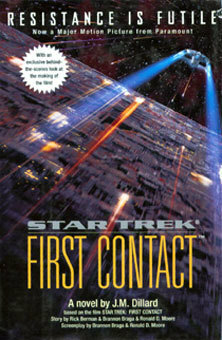 This past April 5 was First Contact Day, marking only 52 years until humans first encounter beings from another world. I observed the occasion by watching the film that introduced this milestone into Star Trek canon: First Contact, the first film to feature the TNG crew exclusively. But it wasn't until this week that I finally popped in the set's second disc of bonus features. I'm not usually a fan of such material and can't remember the last time I listened to a director's commentary, but I'm always willing to make an exception for Star Trek. As I expected, this disc was a welcome addition to the set and not just some tacked-on money-grab. Some of these featurettes were filmed on the set of the movie, but others were shot exclusively for the special edition DVD's 2005 release. They're broadly broken down into "The Star Trek Universe", "The Borg Collective", "First Contact Production", "Scene Deconstruction", and "Archives", for a total of 19 pieces. I first watched the 11-minute "The Legacy of Zefram Cochrane", which details the inventor of the warp drive and how he was cast and written for First Contact. The interviews with Rick Berman, Michael Okuda, James Cromwell, and Brannon Braga focused primarily on the First Contact portrayal of the character but does include some clips and discussion of Glenn Corbett, who debuted as Cochrane in TOS. (Corbett died in 1993, well before Cochrane's reinvention for First Contact.) No mention of a very different interpretation in the non-canon novel Federation was made, though. I spent the next 18.5 minutes with "First Contact: The Possibilities", which was in fact not a montage of scenarios from science fiction or hypothesis of humanity's first encounter with extraterrestrials, but was instead a profile of real-world, modern-day efforts to detect signs of alien intelligence. Representatives of SETI and the Planetary Society shared their methodologies and hopes, detailing some interesting intersections with Star Trek. For example, I had no idea that SETI@home would not exist if not for Paramount Studios! "Design Matrix" dissected the artistry of the Enterprise and its cybernetic inhabitants, the Borg. Although I imagined the budget of the silver screen allowed for more complex cyborgs than their television roots did, I had never consciously noted some of the differences — for example, TNG Borg had helmets and caps, and movie Borg did not. The attention to detail that the First Contact Borg received also allowed for eyepieces that you probably didn't know blinked Morse code messages, usually the names of the electrician's friends and pets. With so much investment in each outfit, the crew had the time and budget to design only eight individual Borg outfits, which were reused time and again in this film and in Voyager. Director Jonathan Frakes was quick to give credit where due, a quality consistent with my meeting him at the Super Megafest a few years ago. "The Story" revealed some alternative angles the scriptwriters tried, including putting Picard in Montana with a local photographer as a love interest, or even setting the entire film in Medieval Ages. I'm not surprised that MAD Magazine spoofed this film when it came out, but I didn't know that their parody was apparently based on one of those earlier scripts. Now I'm keen to get my hands on that lampoon! I was disappointed to find the featurette dubbed "From A To E" was not about the history of the Enterprise, but rather the putting together of First Contact. The crew's analogies amused me, from Ronald D. Moore calling the film "Die Hard on the Enterprise" to Brannon Braga describing the film's conclusion as the "Star Trek nativity scene, with three wise Vulcans". Throughout these interviews, though, Braga and Rick Berman rarely cracked a smile, even as other cast and crew cheerfully shared that "Star Trek is so much fun!" and "First Contact is my favorite film." It was a sharp contrast. There are also a few scene breakdowns that show how the CGI was done (ever liken the Borg sphere to the Death Star? ), with narration by ILM special effects supervisor John Knoll. This and some Easter eggs topped off a great package, though a lack of deleted scenes was noticeable. As much as I appreciated learning more about my favorite Star Trek film, what truly gave a new perspective of it was the novelization. Whether a movie is being adapted to book or vice versa, the source material is almost always superior, but there are nonetheless opportunities to explore the characters and plot in a way unique to that medium. In the case of First Contact, the J. M. Dillard's novel explains to us why Zefram Cochrane is both brilliant and an alcoholic. It gave our protagonist much more gravitas and let me better empathize with him, rather than seeing him almost as the film's comic relief. Two negative changes the book featured (perhaps due to working off an unfinished script) were relatively minor. When Picard claims the phaser from Lily and she demurs "It's my first ray gun," the preceding line in the film indicates that the weapon was set to kill. In the book, it's on its lowest setting, which would've given Picard only a bad burn, making the perceived threat of the scene into fantasy. Finally, before Data's novelized betrayal of the Borg, he gives Picard many not-so-subtle cues. I much prefer the tension produced by his last-minute cinematic revelation. That there are so many important details, both within and behind the scenes, demonstrates how much love was poured into this movie. It's the Star Trek film that I've returned to time and again, and I look forward to celebrating many more First Contact days. Today is First Contact Day, marking only 52 years until Dr. Zefram Cochrane conducts the first successful test flight of a warp drive engine, attracting the attention of a passing Vulcan scout ship and thus engaging humanity in first contact with an alien race. A week from today marks an equally significant event: the fiftieth anniversary of the first manned space flight, that being Yuri Gagarin's orbit of the planet Earth. At the age of 27 and seven years before his death, Gagarin made history by literally going where no man had gone before, opening a new frontier for countless other brave men and women to explore. The anniversary of that occasion is known as Yuri's Night, and to commemorate the fiftieth such celebration, this year's Yuri's Night will see the debut of a documentary dedicated to Gagarin's accomplishment. Dubbed First Orbit, the film will be shown on April 12th for free online as well as at over 220 parties hosted across the globe. It's a day- and night-long celebration of a 108-minute flight that changed history. For a moving documentary that captures many of NASA's accomplishments after Gagarin's precedent, I highly recommend In the Shadow of the Moon. This film and those like it capture a rare and exciting era in exploration that those alive today may not ever see again. Filed under Star Trek; 1 comment. Twenty years ago this autumn, I was a sophomore in college. I remember watching the premiere of Star Trek: The Next Generation (or TNG) with friends. While most of us were fans of speculative fiction, we had little idea of how entertaining and influential TNG would become. I had grown up on the writings of Jules Verne, H.G. Wells, Isaac Asimov, and Arthur C. Clarke, but I had watched the original 1960s Star Trek only in reruns. During freshman year, I had fought for the dorm lounge television with people who preferred The Late Show With David Letterman over some old show with people wearing colorful pajamas, odd makeup, or both. But we were a small but dedicated band, and we made it to the stars. Among the friends I met then was my future wife. Over the course of many late nights and foosball games, I learned about the United Federation of Planets, its Starfleet, and the Prime Directive that forbade its explorers from interfering in the internal affairs or development of alien worlds. The so-called "Wagon Train to the stars" combined Westerns with ray guns, and mythology with scientific speculation. By the time TNG began, I was indeed a Trekkie — or "Trekker," as some prefer — having learned the cant among the franchise's fans: phasers, warp speed, and the Vulcan nerve pinch and salute. Of the eventual six movies with the space opera's original cast, the best two — Star Trek II: The Wrath of Khan and IV: The Voyage Home — had already been released. Thanks to magazines such as Starlog and various "technical manuals," I learned about transporters and Jeffries tubes (the access tunnels throughout starships, named after an original series art director). Around Thanksgiving of 1987, I would attend my first science fiction convention, one run by Creation Entertainment in New York. It's also worth remembering the context into which this Enterprise was launched — that, despite the success of multimedia franchises such as Planet of the Apes and Star Wars, there was little genre entertainment on television at that time. As we look forward to 2007's premieres of Heroes, Lost, or Battlestar Galactica: Razor, among others, note that 20 years ago, there was only Stephen Spielberg's anthology Amazing Stories, horror drama Friday the 13th: the Series, and another Earth-based movie spin-off, Starman. Weak visual effects, even weaker writing, and a lack of interest among mainstream viewers and networks had doomed all but the U.K.'s Doctor Who to short lifespans or syndication. Only 56 years until the Vulcans land in Montana in 2063… In the meantime, click the above link for some great editorials, video clips, and documentaries about First Contact.